Definition: A WebQuest is an inquiry-oriented activity/lesson in which all or most of the information that learners use comes from resources on the Internet. Teacher can create Webquest using different programs, but the most common and simple form is to create a word processing document that includes links to websites. "WebQuests were created by Dodge in 1995, during the early stages of widespread Internet access. With the increase in Internet access in university labs, Dodge began to experiment with effective ways to integrate the technology into classroom instruction" (Strickland and Nazzal, 2005). Using a webquest allows the teacher to know that student are acessing and using valid information, because he/she prior to the lesson chose the web links. There are siz main parts that a WebQuest must include. They are an introduction that sets the stage of the activity, an interesting task, a set of information resources, a process, guidance and organizational frameworks, and a conclusion that provides reflection from students learning. "WebQuests promote student motivation and authenticity, develop thinking skills, and encourage cooperative learning" (Strickland and Nazzal, 2005). WebQuests are based on constructivist learning theory, which include theorist Vygotsky and Piaget. Webquest include group work, prior knowledge and learning. A constructivist approach to learning states that people construct their own understanding and knowledge of the world, through experiencing things and reflecting on those experiences (Gunning, 2012). Student will use what they already know before the lesson and will work together to figure out the overall question or goal of the lesson, which include collaboration and prior knowledge which are big parts of Vygotsky and Piaget's theories. Also WebQuest are included in project-based learning, which is a student-centered teaching method. Students explore real-world problems and challenges to gain knowledge, skills, and obtain a deeper understand of the topic/content they are studying (Vasquez, Sneider, and Comer, 2013). WebQuest are allowing student to also use twenty-first century skills in which they will need to be successful in the future of the society they will be living in. Since WebQuest focus on real-world situations and gives students an end goal it requires a lot of critical thinking which is good for students to be challenged (Miller and Veatch, 2011). Also they are working in small groups so they have the support of their peers and peer teaching and learning to help them develop their communication skills and well and understanding om the topic. What is a WebQuest? How do I create one? Do students enjoy them? Is it too hard? These are all questions that many teacher have and this video answers them all and more. Assess the availability of computers. Maximize class time on the computer. Continue working even after computer time is over. Make assessment clear to students. Be excited about the possibilities. The picture above is an additional picture that helps justify why this strategy is effective and what theories and research there is to back it up. As I stated before Vygotsky and Piaget's theories both support this learning strategy because WebQuest incorporate constructivism. "Research has shown that highest motivation and learning occurs when the teacher sets goals but the student have latitude in deciding how they will reach the goals"
(Vasquez, Sneider, and Comer, 2013). 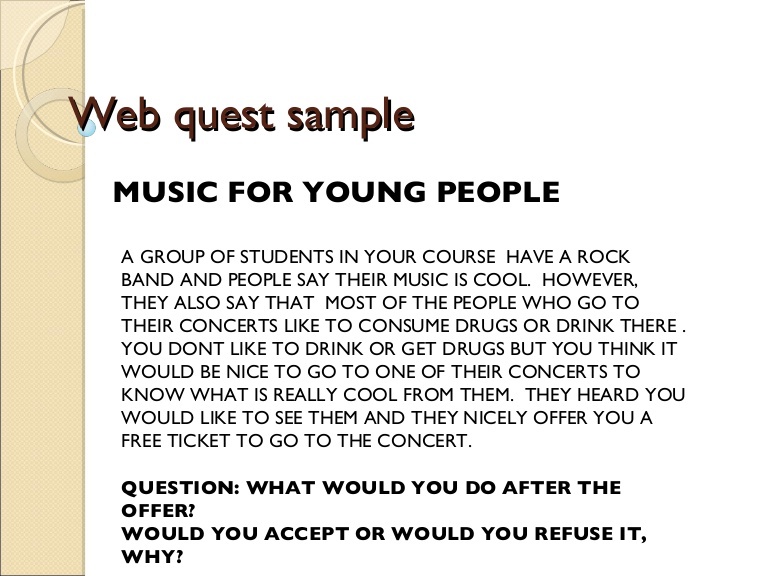 The picture to the right is an example of a WebQuest that could be used during a music unit. This just demonstrates that WebQuest can be used for any topic, any age, and link to any standard. Example of how to make a Webquest using one of many websites. There are also tutorials on how to create them using other websites as well as word. However, this video is a god example if what to include and how to create one. Introduction- Provides background information on the topic and prepares students for activity. Task- Includes an activity that is “doable” and is of interest to the students, relates to content, and includes roles for cooperative group members. Resources- Provides links to high-quality Internet-based resources. Process- Clear and descriptive Step-by-step guide for completion of the activity. Evaluation-Should illustrate exactly what students should do to be successful; usually in the form of a rubric or checklist. ​WebQuest can be used in any content area and for any topic in which the teacher wants his/her students to learn more about. The links below will lead you to an example for math, reading, science, and social studies. Think of a topic and create a WebQuest about it, it is as simply as that. Vasquez, J. A, Sneider, C, & Comer, M. (2013). STEM lesson essentials, grades 3-8: Integrating science, technology, engineering, and mathematics.Portsmouth, NH: Heinemann.